TRRAM : don't miss this one ! The KAIST1 just announced the creation of Transparent Resistive Random Access Memory (TRRAM)2. You want to keep an eye on this one before it disappears. 1 - Korea Advanced Institute of Science and Technology , an almost frequent flyer on these lines. As Home hits shelves, employees hit home. Air France - KLM's Bluenity is taking off the same week. Yet another 2D, 2.0 social networking scheme. But there, you can pal around the terrorist who'll take the same plane as you, and even learn from him about the charms of Afghan mountains. I suggest a new social networking concept : with VdId (Virtual Dissociative Identity Disorder), I will make all my online aliases meet each other. Who knows, they may find out some kind of common ground / common sense. 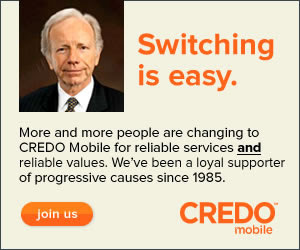 For those who can't read the banner, there's a big "switching is easy" next to Joe's face, and below an invitation to join CREDO mobile : "more people are changing to CREDO mobile for reliable services and reliable values (NB : the "and" is not only bold - I mean the typo - but also underlined). We've been a loyal supporter of progressive causes since 1985". Apparently, the Lieberm'ad has been running for a while, and was part of a scheme to strip America's most famous political weather vane of his Homeland Security Committee chairmanship*. Everybody knows Joe The Switcher eventually kept his chair. This campaign is now focusing more than ever on promoting one cause : the CREDO brand. Anyway, either by trickling down on its own, or because Working Assets have this thing for spreading it around, part of this wealth will end up benefiting other causes**. ** I still don't know how many subscribers CREDO mobile have, but The Courage Campaign claims that they gathered over a week "200,000 signatures on a pledge to repeal" the Proposition 8 ("Join the Impact: California’s Prop 8 Discrimination Becomes a National Issue" - Rick Jacobs - The Courage Campaign / California Progress Report 20081116). Tested earlier this year*, Orange Money is officially launched in Ivory Coast. French giants Orange (Orange CI) and BNP Paribas (BICICI) found the perfect spot to try the concept without meeting much resistance from regulators / rival lobbies. Beyond the country and the region**, the aim of the game is naturally to advertise on a potentially global platform. Opening a Orange Money account enables the Orange customer to make secured transactions with the operator (buying call credit, paying bills) and far beyond (deposits and withdrawals up to 150 euros, transfers from one person to another). A killer app if any for emerging markets where very few people have a bank account, but more and more use a mobile. Significantly, BelkoFinance (microcredit) is also a partner, and this commercial launch happens the same week as the full launch of Payez Mobile*** in France. ** Jordan, Mali and Senegal were announced for 2009 last may in an interview on STMR. The USSD based solution was officially approved by the BCEAO (Banque Centrale des Etats de l'Afrique de l'Ouest) which operates in Ivory Coast, but also Benin, Burkina Faso, Guinea Bissau, Mali, Niger, Senegal and Togo. *** see "Payez mobile, at last"